Winter Scene Building + Sunny Studios 3rd Anniversary Blog Hop! Did you know that Sunny Studio is also celebrating their 3rd birthday?! A HUGE shout out to my sweet friend Mendi for reaching yet another amazing milestone in her creative journey! I remember when she first started her amazing little company… I was so happy for her to be able to take something she loved doing – creating – and turn it into a thriving company! Happiest birthday wishes to you and Sunny Studios, Mendi! I’m participating in a blog hop in celebration of Sunny Studio’s 3rd Birthday… if you have already been hopping along, you should have arrived from the oh-so-talented, Kay Miller’s blog! 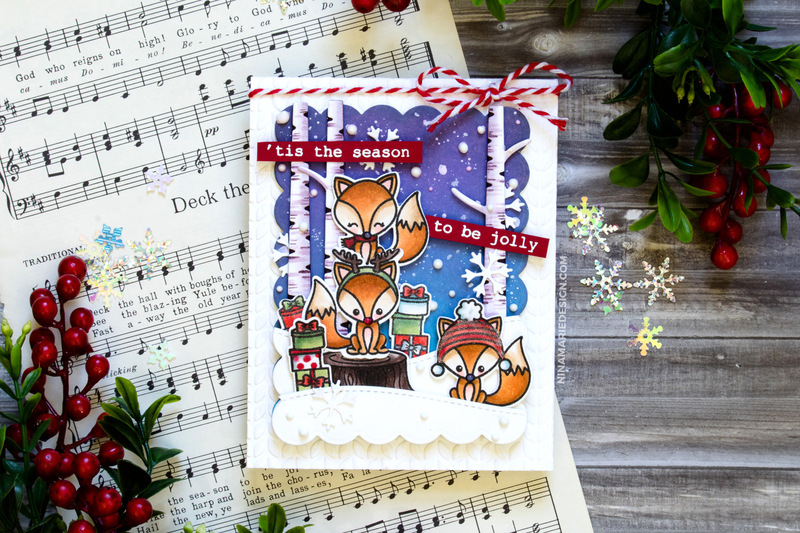 The critters used in this card are from the darling, Foxy Christmas stamp and die set. These little animals just make me smile… especially the one with antlers! I made that fox look like rudolph of course, complete with a red, Nuvo Glitter Drops dot for the nose! Click here for Copic colors used on this project. Behind the foxes, I have a Distress Oxide ink blended sky (using Wilted Violet, Peacock Feathers and Broken China). I added birch trees to the scene, cut from the Rustic Winter die set. Sunny Studios is also now creating embossing folders! I love using these to add texture to a card base; on this card I used the Cable Knit folder on my A2, Luxury White Gina K. Designs card base. For the greetings on my card, I used the Memory Box Typewriter Holiday Sentiments set. There are dots of white Nuvo Gloss Drops, and white, die cut snowflakes (from the new, Sunny Studio Warm and Cozy set). There is also hints of glitter here and there, which was added with a Tonic Studios clear Aqua Shimmer pen. For a final touch, I used Lawn Fawn Peppermint Trimmings to tie across the top of the card. Scene building is such a great way to stretch your stamps and dies! I have always enjoyed creating elaborate, as well as simple scenes for years. 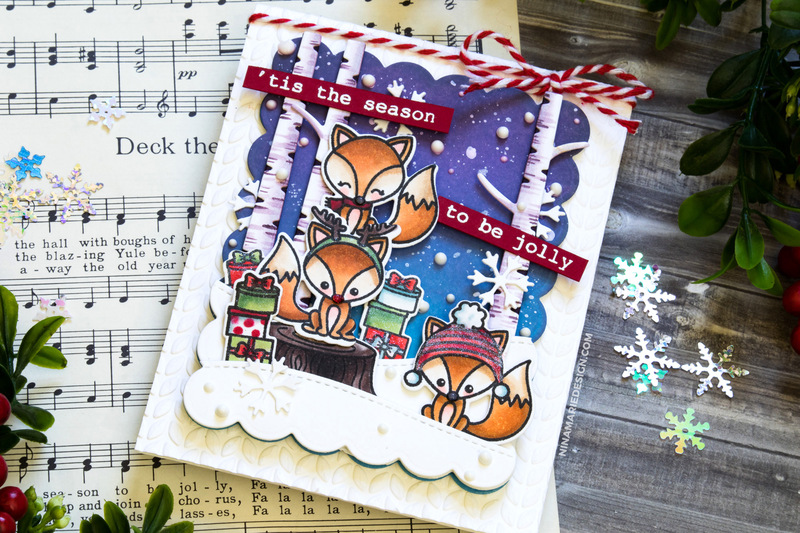 And the images in the Foxy Christmas set is perfect for making many holiday and winter scenes. What I always find fascinating is how you can achieve so many different results with just a single set. I’m curious to see how you and so many others will be using these images! I hope you have enjoyed today’s video tutorial and are inspired to create! Be sure to keep on reading for details on the blog hop, plus giveaways! Thank you for visiting today, and have a fabulous Friday! Your next stop in the hop is the so-very-talented, Vanessa Menhorn! If you want to see the entire hop order, be sure to visit the Sunny Studio blog! Sunny Studio is giving away a $25 gift card at every stop along this hop! Woohoo!!! To have a chance at winning, please leave a comment here (and at other stops along the blog hop). You have until Monday, October 1st, 2018 at 11:59 pm PDT to comment. Winners will be announced on the Sunny Studio blog Friday, October 5th, 2018. Your card is amazing! Thanks so much for the video and inspiration! luv the addition of the large snowflakes. great card, Nina! Everything about this is AMAZING! You have created such a fun scene with some amazing little details that make it super special, like the little touch of glitter on the hat! You are always inspiring! 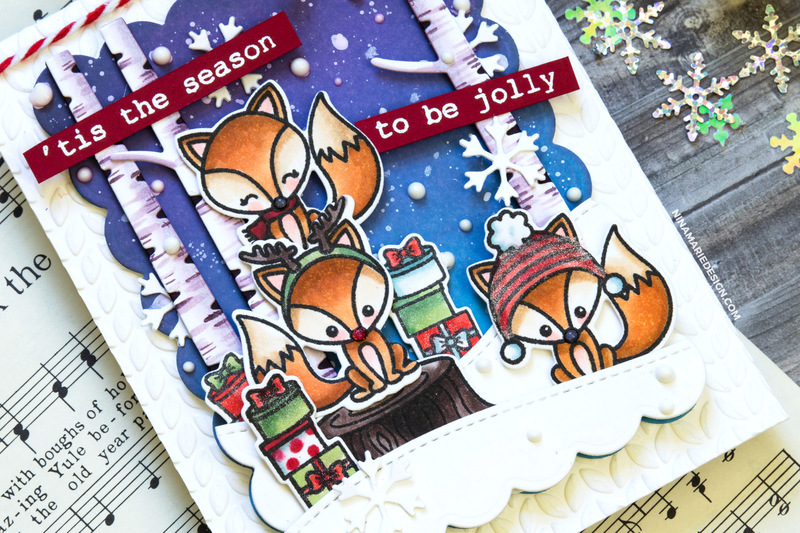 wow what a fabulous card…love teh cute foxes and the great layered scene you created …so cool. Your scene is fabulous!! Thanks for sharing your creative process in a video. The foxes are so cute and I love the addition of strokes to create that birch bark look. Such a great card!! I love this card!! Your video inspired me to buy the “Rustic Winter” die. I really want to try making some of those birch trees. I would never have thought to use purple on the trees…they look so realistic! Great job! Great card, thanks for sharing it! Beautiful card and wonderful colouring. 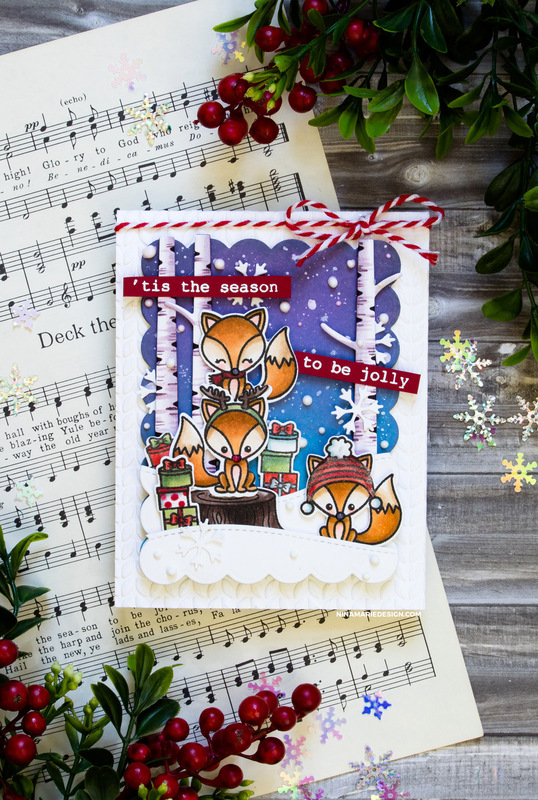 Fun and festive woodland scene. Your card is adorable ! I really love this stamps set as well as the Lamas’ set. These foxes are absolutely adorable! Love how you color them and all the elements to complete this wonderful design! Thanks for the inspiration Nina! Love this, it just made me smile! Fabulous design and colouring, as usual, this card is simply too cute for words! I love this card! It is absolutely adorable! This card is absolutely adorable! WOW! This scene is super cute and so wintry! I LOVE IT! The little foxes are so cute and I love how you colored them all up and included lots of presents for all their forest friends! Beautiful sky background and love all the detail! That is a darling, cheery Christmas card! Perhaps the most detailed I have ever seen! There is so much detail in this card!! The background is phenomenal, the trees look so real, the foxes look so—foxy!! I love everything!! Great work! !